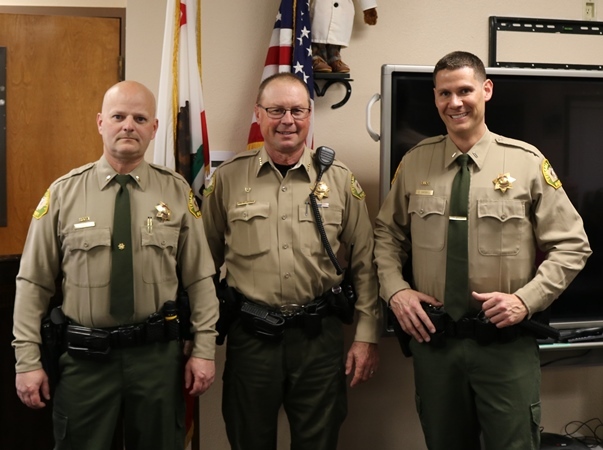 On March 21, 2019 Sheriff Dave Hencratt swore in two new Sheriff’s Lieutenants, filling the two vacancies that were left with the retirement of Lieutenant Dave Greer and Lieutenant Don Thomas. Sergeant Jeff Garrett and Sergeant Derek Sherrill were selected by Sheriff Hencratt from a group of six applicants for the positions. Lieutenant Garrett has worked for the Tehama County Sheriff’s Office since 1998. Lieutenant Garrett’s previous assignments have included; Jail, Patrol, Civil, Boating, DARE Instructor, Marijuana Eradication Team, Narcotics Agent for the Tehama Interagency Drug Enforcement (TIDE) Task Force, and Investigations Divisions. He has been a Jail Training Officer, Field Training Officer, and Patrol Sergeant. Lieutenant Garrett is currently a Team Leader for the Inter – Agency SWAT team of which he has been a member of since 2002. He is also a member of the Sheriff’s rescue dive team and is one of four Department Range Instructors. Lieutenant Garrett most recently has been assigned as the Detective Sergeant and has overseen the Sheriff’s Investigation Division. Lieutenant Sherrill has been employed with the Tehama County Sheriff’s Office since 2008. Prior to his employment with the Sheriff’s Office, Lieutenant Sherrill served Active duty Airforce, Security Forces between 2001 and 2005 with three separate deployments to the Middle East during operation Enduring Freedom and Iraqi Freedom. Lieutenant Sherrill’s previous assignments Tehama interagency swat team, Field Training Officer, Investigator, range instructor, and a member of the dive team. Lieutenant Sherrill was most recently assigned to the patrol division as a patrol Sergeant. Lieutenant Garrett and Lieutenant Sherrill will assume their new positions on April 1, 2019.